An ongoing study by Civitas Institute’s Myrick reported here, finds that 832 people over 112 voted by absentee ballot in 2012. Since there are only 330 people over 110 in the U.S. according to the 2010 census, this appears to be something of a record. 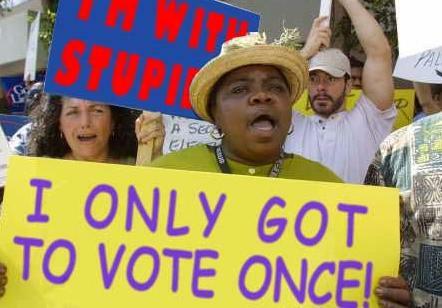 February 19, 2013 North Carolina’s Civitas Institute has revealed that the North Carolina State Board of Elections and the Obama campaign conspired to register at least 11,000 people via the internet in violation of state law. This has been confirmed through records requests filed with all of North Carolina’s 100 counties. The counting is not yet complete. According to Civitas, three years ago the state began exploring ways to get around North Carolina voting laws in order to allow online voting. Currently California, Arizona, Colorado, Indiana, Kansas, Louisiana, Oregon, Utah, Washington, Nevada, Maryland, and New York allow some form of online voter registration. North Carolina and many other states do not. For obvious reasons, this method is fraught with vulnerabilities to fraud. Read more here.